Plug into the most accurate and complete charging station map worldwide and download the #1 EV charger locator app. - Engadget: "a complete database of public charging stations across the US." 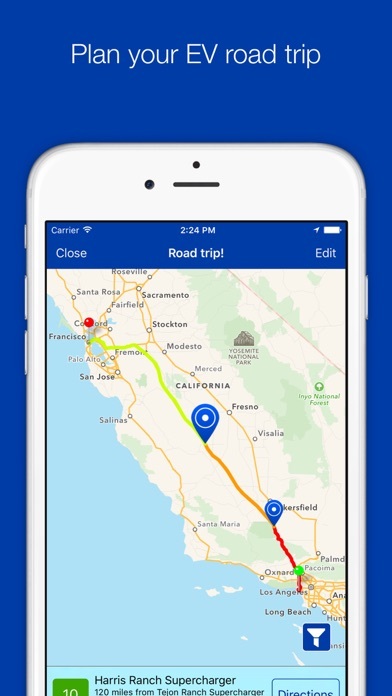 - CleanTechnica: "makes trip planning easier and more effective." - Green Car Reports: "tips from actual users of the individual sites [is] one of the most useful features--and there, PlugShare has the clear edge." PlugShare has the world’s biggest and most accurate public charging map. You’ll find over 140,000 public stations, including all major networks in North America (Tesla SuperCharger, ChargePoint, Blink, SemaCharge, GE WattStation, AeroVironment, EVgo) and Europe (RWE, Clever, Endesa, Enel). It’s also the world’s largest EV driver community. 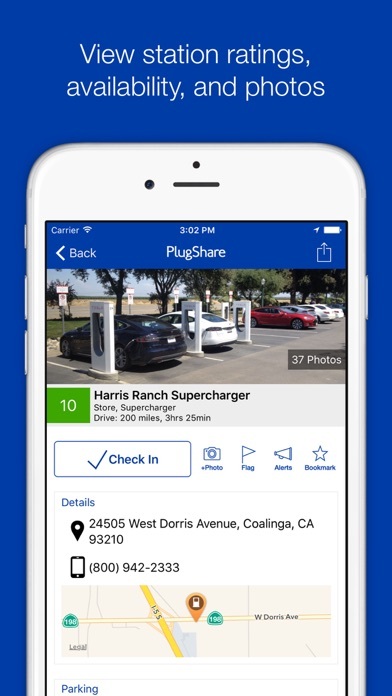 PlugShare users have contributed nearly 1,000,000 station reviews and photos to help drivers make the most informed charging decisions possible. It’s also the official EV charger locator for the Nissan No Charge to Charge Program(sm) and the MyFord Mobile app. 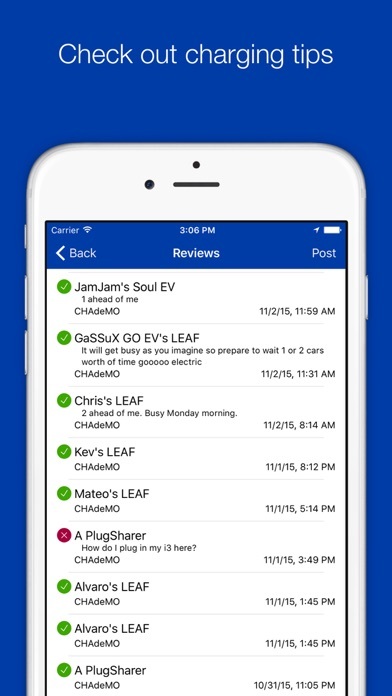 PlugShare has been featured in the NYT and the WSJ, and the app was spotlighted on Earth Day by the App Store. 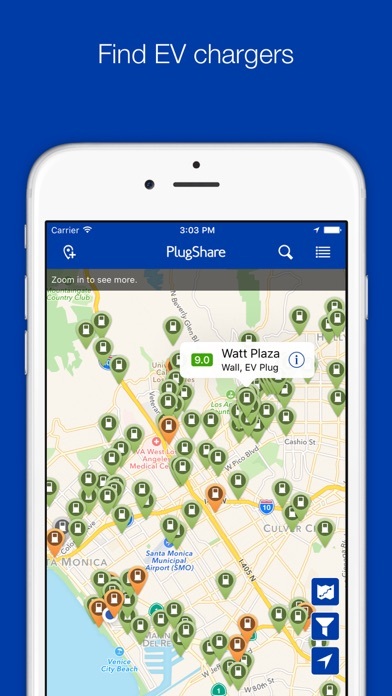 PlugShare lets EV drivers... - Find public charging stations compatible with your EV. - See station ratings, real-time availability, photos, and descriptions. - Browse reviews and tips from other drivers. - Quickly pay for charging through your phone at participating locations. - Filter for chargers compatible with your electric vehicle. - Add new charging stations as you discover them. - Message fellow EV drivers: a great way coordinate sharing a charger (even non-networked stations). - Plan your next EV road trip route and see all the charging stations along the way. Doing my first road trip with an electric and I made every mistake possible charging. Someone told me about this app and it takes out all the guess work. The search is not simple. I was at a shopping center and trying match the outlet to the app and it was not straight forward. Maybe place a qr on the charger so that I instantly can get to the right item. Helps you connect with businesses that are EV friendly and looking for your business. There’s no area to give a station a rating, but if you check-in, it automatically bumps up a score. I don’t like that. I wanted to give a station a 2/5, but because I checked in, it upped their rating by .2. This tells me it’s an inaccurate rating system. I don’t like that. PlugShare is the most useful app on my phone! This is the only app that really matters for all EV drivers and I’m amazed it hasn’t been acquired by a bigger company yet. Without this app, our 2000 mile road trip would not have been possible and I use it whenever I’m going anywhere I’m going to need a charge away from home. I was very excited when they added Trip Planner to their web platform. 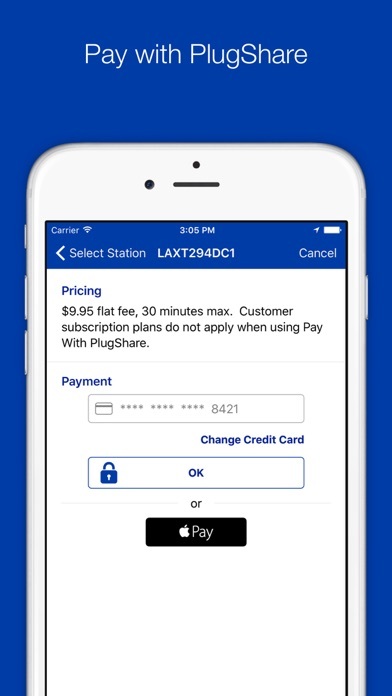 And now that they’ve added Pay with PlugShare, it’s edging closer to the “can’t live without” status. My first time reviewing an app, because I want more people to use it. Especially the check in feature. Fingers crossed for Apple Car Play integration. This is by far the best Electric Vehicle app bar none. Apple says they are EcoFriendly. Time to make your actions match your marketing. Know where the charger is and if it’s working and available. Awesome. Always being updated, live links to several networks, accurate. The Best. If only Apple would make Plugshare work with CarPlay. Tesla has added stations to their network that are not reflected here. This app is very useful but it doesn’t get a 5 star because some of the plugs don’t show up on the map sometimes and you can only search them to find it. If a developer is reading this, try to fix that glitch. I plan all my trips with this app. It would be great if it could be integrated with Imaps or google maps. What the hell! Network error when I am in 100 Mbps WiFi connection! Can’t use PlugShare now! It kept saying Network Error. I have used PlugShare for 5 years. I LOVE it. I can’t sign it. Nothing works! I am lost without it. Help!!! Just downloaded the app and I can’t activate the charger — not via the app; or via the charging station with the app; or with a credit card ; not with Apple Pay at the charging station. Holy cow!!! What an awesome experience ! Great app and a truly universal solution to a fragmented charging availability and varying companies that provide charging. Can’t live without it! Charging station works Type 2 Nice staff. I guess I’m not in bolt country. I wanted to introduce our wonderful Smart City to the world. What better way to experience Orlando and the sounding area, than to visit the new and totally innovative Lake Nona, Florida! Centrally located in Florida, Lake Nona is the new hot bed of modern day Smart living. From the newly created Medical City to the High Tech Town Center, Lake Nona delivers what some are still trying to wrap their minds around. From smart charging EV stations to the Autonomous Vehicle, Lake Nona is staged to blaze a trail where no city has gone before. You have to come see it to believe it! Unable to sign in or reset password. why can’t we delete trips, or at least edit the destination? Might be a great app but I couldn’t get past all the terms and conditions so I deleted it off my phone. Did anyone else read all the data they are collecting? I wasn’t okay with it. It was the longest T&Cs I’ve ever seen on an app. Anyhow, this isn’t a slam on the app; I’m sure it is great but in this age of data mining, just wasn’t comfortable using it. Tesla owners get free coffee with Tesla card ! I spent some time to bookmark all the charges I like. I assumed I would be able to find the bookmarked charges based on my location, or on the map. But doesn’t seem possible, I can only see bookmarked chargers as a list, not on a map view. This app works well except on rare occasions when those who use a charging station don’t report it. Please check in and review your experience. If possible, take a picture. I used the app to plan travel within 30 of home. I knew I would need to charge to get enough miles to get home given the lower charge in the cold. Both charging stations in the vicinity of my destination were “out of order”. Bottom line, had to have car flatbedded home. This app stays wrong so much so It lives one hundred inaccurately lane. If you own an EV you simply must have this app. This is my go to Tesla Model X app. I use it to find alternatives to Supercharging when towing a trailer with the X. And on road trips up to Seattle. I use it to check on local chargers and pay. For the AV network, Blink network, and Chargepoint I pay through those systems. I’m testing out the non Tesla charging infastruture and deciding who’s good and who’s a pain in the a**. 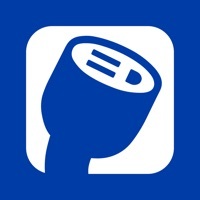 PlugShare enables this activity. . Works great for finding chargers and checking in. I’ll be back and willing to share if you show up at the same time! I couldn’t get by without this app! Great trip planner and so much more. 💙 the app and would give it 5 stars if it were accessible on my infotainment system via CarPlay. Promote safety and hands free searching by getting on CarPlay. Terrible terrible terrible. 1. Can’t find my car. 2. Takes 3 minutes to deactivate and there isn’t an option to stop the process on your own. 3. Use any app but this one. Just would be nice if the outlets had coffee or more restaurants..
As a 17-year EV driver and co-founder of PlugInAmerica I have depended on PlugShare for my trip planning since it first appeared several years ago! Thank you PlugShare! I don’t leave home without you!! !